The aprons are all cut and planed smooth and I spent a few hours fitting all of the tenons into their matching mortise. Some minor adjustments and everything fits well. 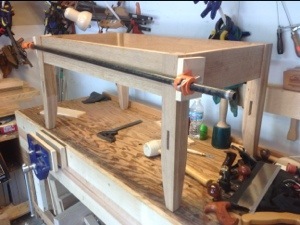 Using a couple of pipe clamps I assembled the legs and apron to take a first peak at the table. Each of the aprons needs to be shaped with a small arch. Like the leg shaping a made a template out of 1/2″ pine and penciled in the shape of the curve. Using a saw i divided the cuts into smaller sections and then using a chisel chopped along the line. A spokeshave made light work of finishing the curve. I have leaned that this curve is too gentle for my rounded spokeshave and I am contemplating using a flat spokeshave for the remaining three. I think that this will allow me to make a more consistent curve a cut down on the amount of final smoothing that I have to do. I really like the shape of the curve you added to the apron. I’m curious though about the technique you used, wouldn’t a coping saw have been a choice to cut it followed by the spokeshave? I wasn’t aware of the cut and chop technique you used. Absolutely, a coping saw works well also, in fact one side of the second apron was cut with a coping saw. Because of my inability to cut a straight line with the saw,it took longer for me to smooth the curve immediately under the upper curve. I found the chisel a little quicker. It’s also a fun method when the grain works with you and you can pop out the pieces of oak very quickly.